Thom Conboy at BYS has joined Vassilis Fotilas and Neal Esterly at Fraser Yachts to list the 49.8m motor yacht Satori for sale. Delivered in 2011, Satori is part of the Heesen family with sporty lines that combine the exuberance of the 37 Metre Series with the decorum one might expect from a larger yacht. Frank Laupman, from Omega Architects, was responsible for this, and his triumph was in combining these good looks with a range of spacious deck areas. He was helped in this endeavour by the highly practical requirement to keep the yacht’s tonnage beneath 500GT. In principle, the layout of the interior by Remi Tessier is conventional, with saloons at the aft of the main and bridge decks, and the master cabin set forward of a lobby and galley that occupy the centre of the main deck. On the lower deck is a stern garage that connects to the engine room, four guest cabins and crew quarters in the bow. The four guest cabins – two large full-beam VIP cabins and two smaller twins of equal luxury – open off a lower deck lobby lit with a luminous slab of backlit onyx. 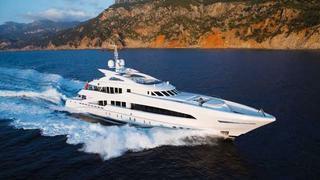 Satori was a winner at the 2012 World Superyacht Awards and is asking €27.9 million.